Background: Homegardens are ecologically and culturally important systems for cultivating medicinal plants for wellbeing by healers and farmers in Naxi communities of the Sino Himalayan region. The cultivation of medicinal plants in Naxi communities and associated ethnomedical knowledge base for maintaining and utilizing these resources is at risk with expanded commercialization of natural resources, development policies and rapid socio-economic change in China. Research is needed to understand the medicinal plant species maintained in Naxi homegardens, their use and contribution to community wellbeing, and how these practices and knowledge base varies between Naxi healers and farmers in order to develop plans for biodiversity conservation and preservation of ethnomedical practices. The main objective of this study is to document and compare medicinal plant species in Naxi homegardens and associated ethnomedical knowledge between Naxi healers and farmers. 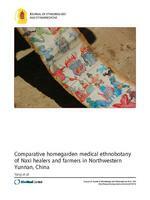 Methods: Ethnobotanical homegarden surveys were conducted with three Naxi healers and 28 farmer households in two Naxi communities in Lijiang Prefecture in Northwest Yunnan Province of China. Surveys included inventories of medicinal plants in homegardens and semi-structured interviews with homegarden managers to document traditional medicinal uses of inventoried plants. Inventoried plants were classified into 13 ‘usage categories’ of medical condition groupings that impact a system of the body. Finally, plant species richness was calculated for each homegarden and species richness was compared between healers and farmers as well as between study sites using a Least Square Means Tukey HSD function. Results: Ethnobotanical surveys at the study sites found that 13% of households rely exclusively on traditional Naxi medicine, 26% exclusively use Western medicine and 61% use a combination of traditional Naxi and Western medicine. A total of 106 medicinal plants were inventoried in Naxi homegardens representing 50 botanical families. Over 85% of inventoried medicinal plants were herbaceous. The most represented families were Asteraceae (12.8%), Ranunculaceae (8.3%), Apiaceae (8.3%), and Polygonaceae (7.3%). The primary medical functions of inventoried plants were to treat inflammation (73 species), circulatory system disorders (62), nervous system disorders (41), detoxification (39), digestive system disorders (33), muscular-skeletal system disorders (26), genitourinary system disorders (26), skin conditions (23), respiratory systems disorders (22), and cold and flu (20). Local herbal experts maintained greater medicinal plant species richness in their homegardens compared to local farmers as well as had greater knowledge of medicinal functions of plants. Healers maintained medicinal plants primarily for healing while farmer households maintained approximately 90% of the medicinal plants in their homegardens for commercialization and the remaining for household healthcare. Conclusions: This study highlights the importance of biodiversity and traditional ecological and medical knowledge for human wellbeing and livelihoods in Naxi communities. Conservation efforts and policies are necessary to preserve the ecological and cultural base that maintains medicinal plant use by both healers and farmers in Naxi homegardens of the Sino Himalayan region.